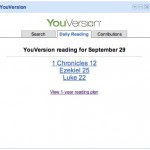 Today we officially launched the first YouVersion.com Google Gadget. If you find yourself using the very useful igoogle.com interface take a minute and install the gadget. Thanks Billy - been waiting for them to develop this!